"Reading a book" is a classic important but non-urgent task. When your lifestyle lacks any book time, you know you're in the wrong quadrant. 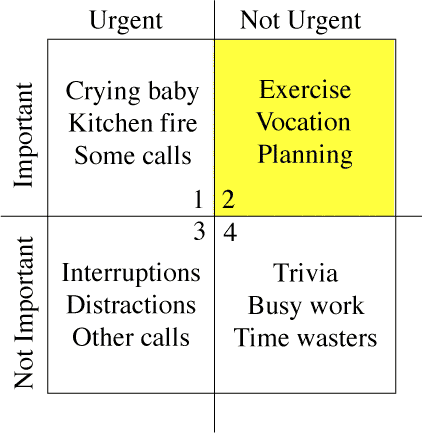 This is a reference to the four quadrants matrix (urgency versus importance) from the book 'First Things First' by Stephen Covey et al. The idea is that many of the things we do can be ranked as either important or unimportant, and as urgent or non-urgent. It's a neat and enlightening concept, but there's something utterly impractical about it. Maybe that's why I've always felt uneasy about the four quadrants idea. Don't spend time categorizing everything into one quadrant or the other. Don't get caught up in grandiose and abstract questions like "Do I have my life values in order? Am I doing first things first every day?" Just ask yourself the simple, practical question "Have I read any good1 books lately?" Your answer sums up a hell of a lot about how you're life is going. If you find you're not reading any good books, then you know right away that your life is out of balance. Now stop staring at your navel, and go read Slaughterhouse-Five. Bonus unrelated wikipedia link: Four-Quadrant movie.